Lockport, NY (March, 2019) - Clark Rigging & Rental would like to introduce the newest addition to their fleet - a Hoist FR 25/35 Extendable Counterweight lift truck. This 35,000 lb. capacity machine is extremely versatile and provides a vast range of capacity options by utilizing various attachments for moving heavy machinery in low overhead conditions. The counterweight frame of the FR 25/35 is extendable, designed to provide stability at full capacity and extended load centers. 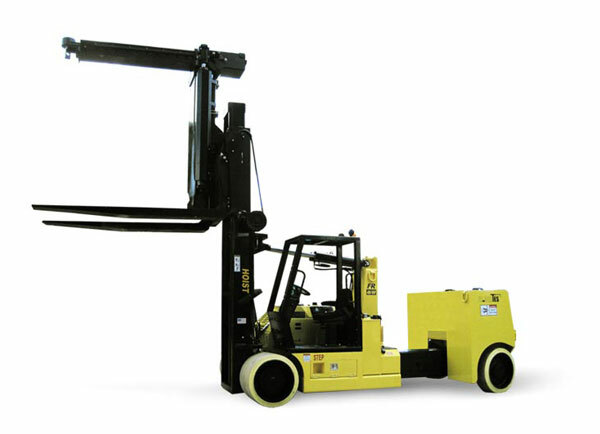 The lift truck's compact design allows for excellent maneuvering in confined areas. Quick-change forks and a removable hydraulic boom also provide flexibility and optimize efficiency when on the job-site. With a maximum boom height of 22 feet, this powerhouse is a suitable option for heavy indoor lifts. Although Clark Rigging & Rental is primarily known for their extensive fleet of cranes, the introduction of the Hoist FR 25/35 gives their customers yet another option for tackling their toughest projects. Call us today, and let us show you the benefits of using the Hoist FR 25/35 Extendable Counterweight lift truck on your next project.